I’m so excited to be working with Tammi as a Featured Co-Host over at Momma’s Meals. Tammi is the Momma and Cook behind Momma's Meals. Every Friday she has what’s called “Featured Friday’s”. So every Friday she has someone new to Co-Host with her. This week Tammi asked me and I graciously accepted. All she does is choose a recipe from my yummy collection and makes it in her own kitchen for her and her family. Then she posts pictures and comments about it! Sounds fun doesn’t it! Be sure to visit Tammi at Momma’s Meals where she posts lots of new recipes and writes about being a SAHM to her daughter Madison!! 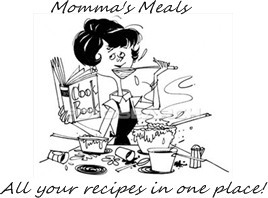 Let’s see what Tammi has cooked up from my collection...head on over to Momma's Meals! Happy Friday everyone! Hope you have a fabulous weekend! Yay! I can't wait to see what Tammi made. Off to check it out! Have a fabulous weekend, sweet Maggie! Yay! Was awesome Co-Hosting with you Maggie! I'm having the lasagna for lunch right now as I type!! Stay in touch momma!! Oh, how fun! I'll pop over to check it out. Have a wonderful weekend, Maggie! How fun! Off to see. That sounds like it will be great fun--and great exposure for your blog. Congratulations on the opportunity! Sounds Great!!! looking forward to see next posts. How wonderful! I will check out her blog and see what yummy recipe of yours she has cooked up! Hope you are feeling great!!! How wonderful! Exciting and fun!